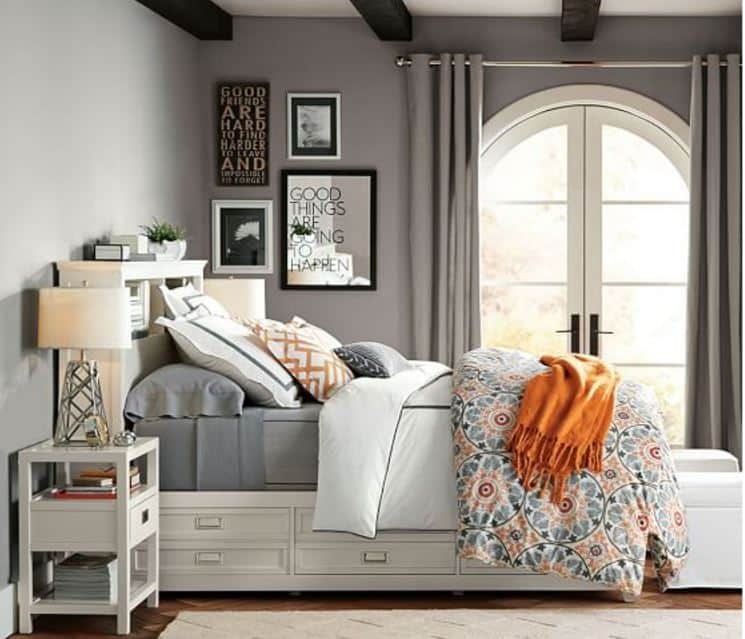 A small bedroom can be a challenge, but it doesn’t have to be boring. Here you’ll find loads of smart ideas for how to organize, decorate and add style to a small bedroom. I adore the coziness of small bedrooms, but figuring out how to organize, decorate and add style to them can be a challenge. Instead of tackling the entire room at once (which can be overwhelming), let me show you how to break the process down into smaller parts that you can take care of one at a time. Many people will say that the walls in a small space should always be light in color. I believe it’s purely a matter of personal preference. 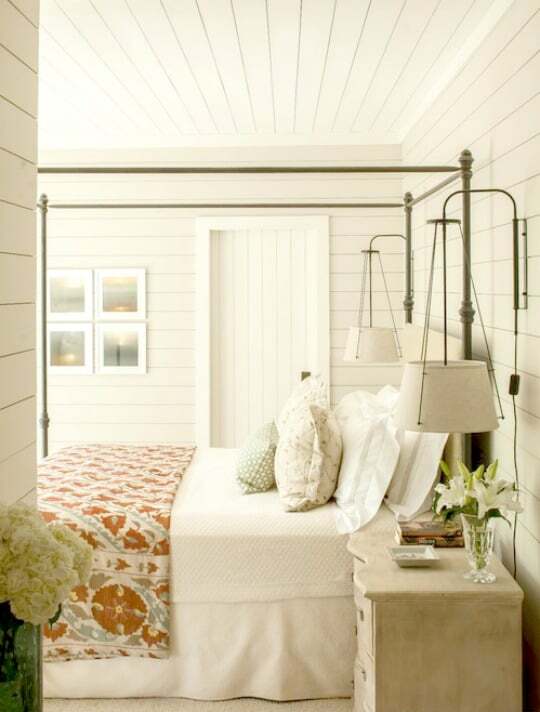 If you crave a bright and airy bedroom, then light walls are definitely the way to go. But if you desire an intimate and cozy space, then start with dark walls. You’ll have an instant cocoon to nestle in. 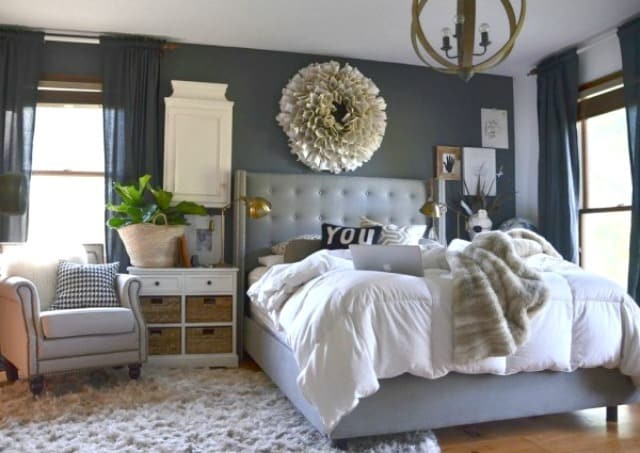 You might prefer a monochromatic color scheme, but be sure to use varying shades of the color and to add in texture and to keep the room from looking flat. Want some color on your walls? 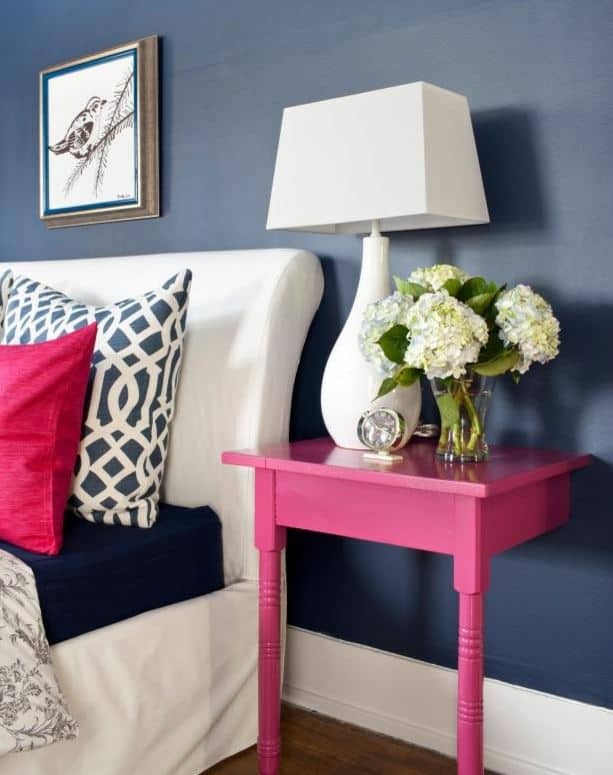 Consider using a soft color – a bright, bold color can be “in your face” in a small bedroom. 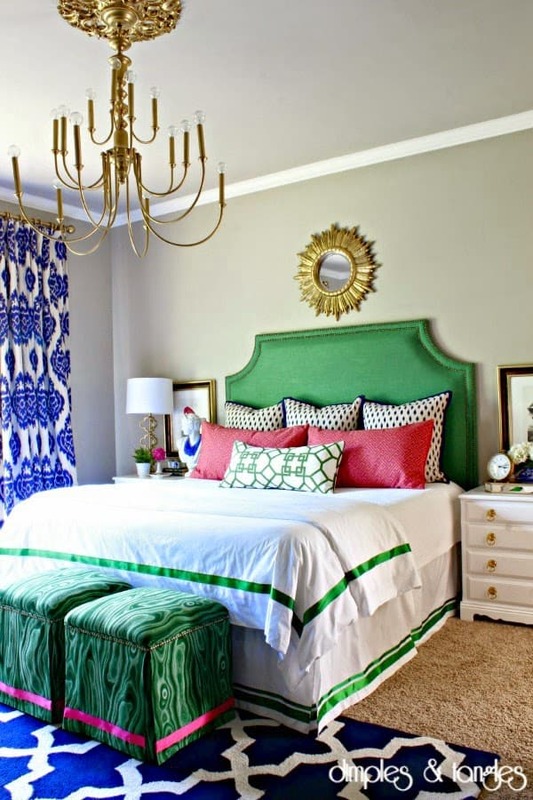 Be sure to repeat the color throughout the room for a cohesive look. 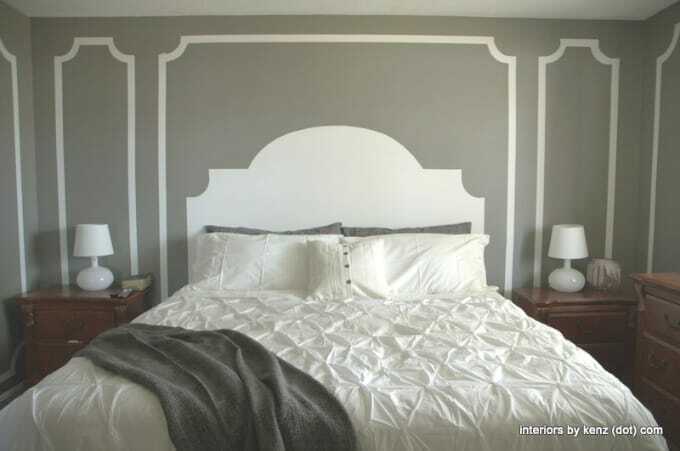 Painting one wall a darker color than the surrounding walls will add a sense of depth. The bed is likely to be the largest single element in your bedroom. How you dress it will make all the difference in the world! Keeping it simple and crisp will create an open feel while still looking inviting and luxurious. 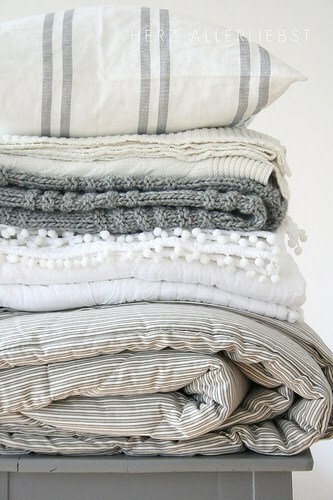 Bedding with a lot of pattern, no matter how beautiful, has the potential to create a cluttered look. 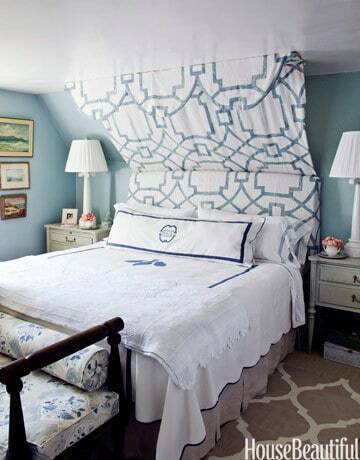 If you must have patterned bedding, keeping the pattern subtle and not overly large will cut down on the busy look. This example is a wonderful mix of patterns, solids and colors. 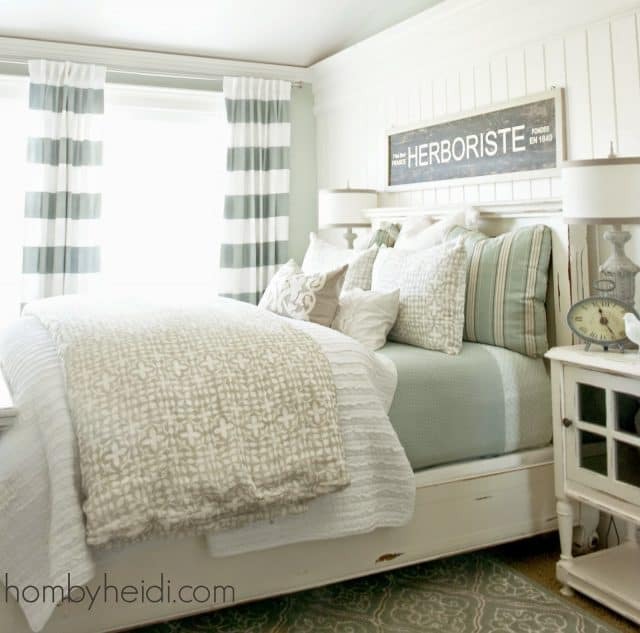 Here’s a perfect example of a mixture of subtle patterns and soft colors. Since floor space is at a premium in a small bedroom, use pieces that do double duty. 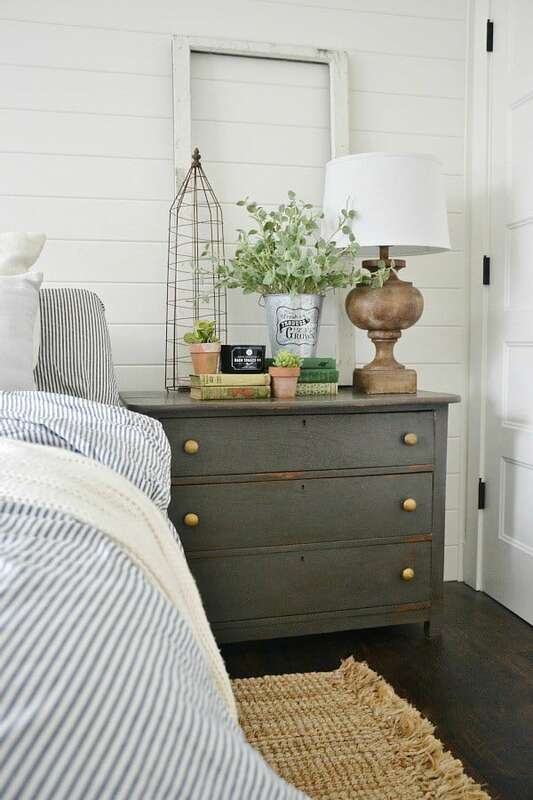 A small chest can serve as both a nightstand and hold clothing. Need office space, but don’t have a dedicated room for it? A desk can double as a nightstand. The chair will provide a spot to sit when working or when putting on your shoes. Even better if you can wrap it around a corner and add shelves above. An upholstered headboard can add a real feeling of luxury to your bedroom and will create a wonderful focal point. 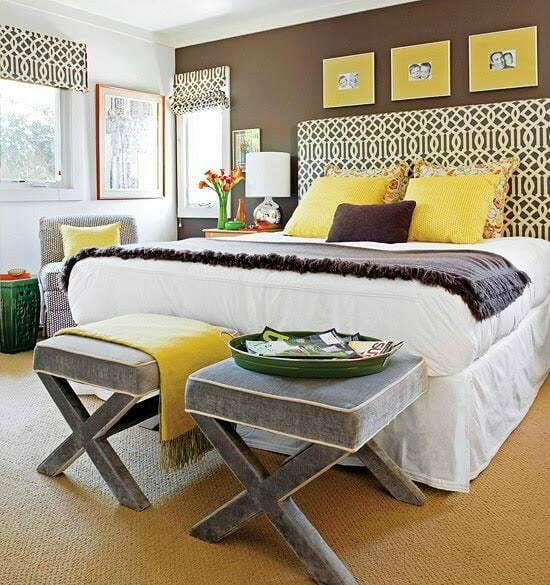 This is a great place to add a pop of color and/or pattern without overwhelming the room. Ready-made upholstered headboards have become so affordable over the last couple of years. 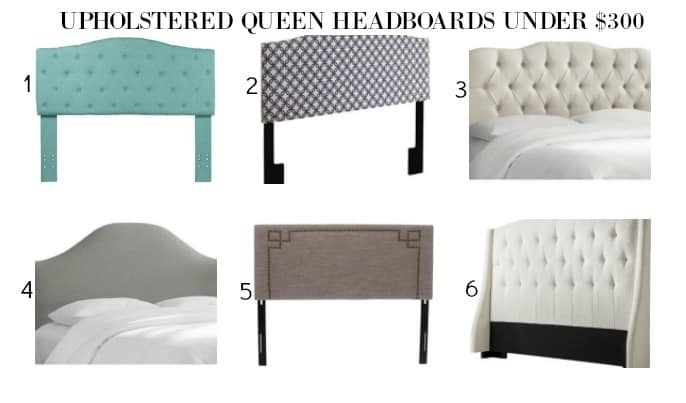 Each one of these queen size headboards is under $300, with many of them being under $200. 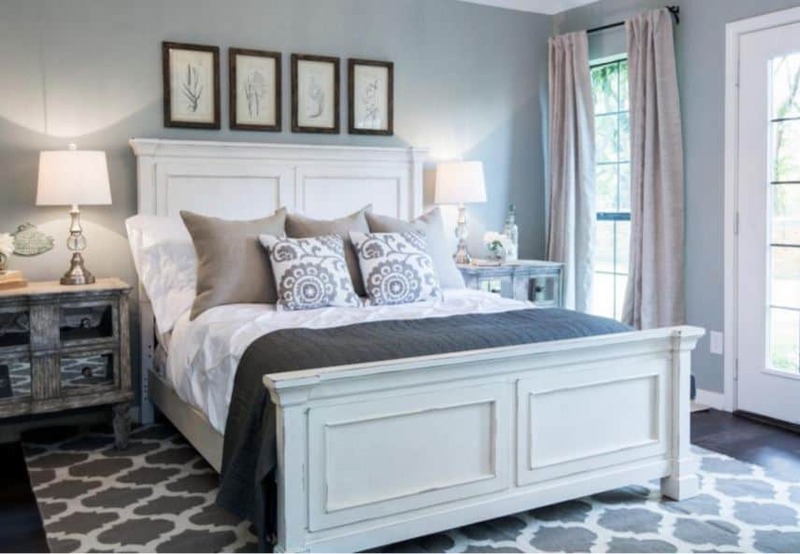 If the space in your bedroom is so tight that you can’t spare the inches for a headboard, painting a faux headboard is a great money saving option and takes up zero floorspace. If a knee wall is the only place for your bed to go, don’t despair. Swagging a piece of fabric is a stylish headboard solution. Don’t have room for a full size end table? How about cutting a table in half (or even smaller) and attaching it to the wall with small angle irons. Paint it a bright color for a fun POP! In a child’s room or guest room, a daybed saves valuable floor space. Built in bookshelves allow for storage and act as a place to hold bedside lighting. 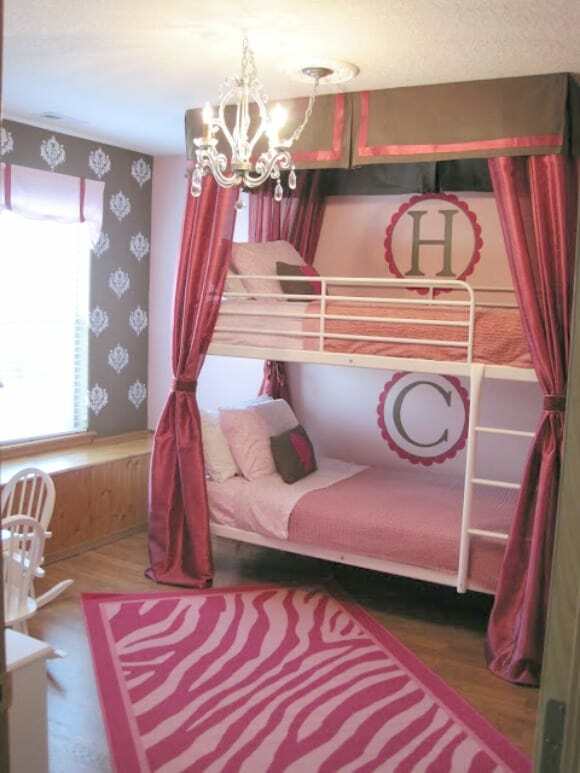 Speaking of children’s rooms – bunkbeds are another great space saving option. But why not dress them up? We all know that being organized is a must in a small bedroom. A wall mounted jewelry organizer not only stores your jewelry, but can serve as a piece of art too. Plus, a wall mounted organizer won’t take up any space on your dresser. 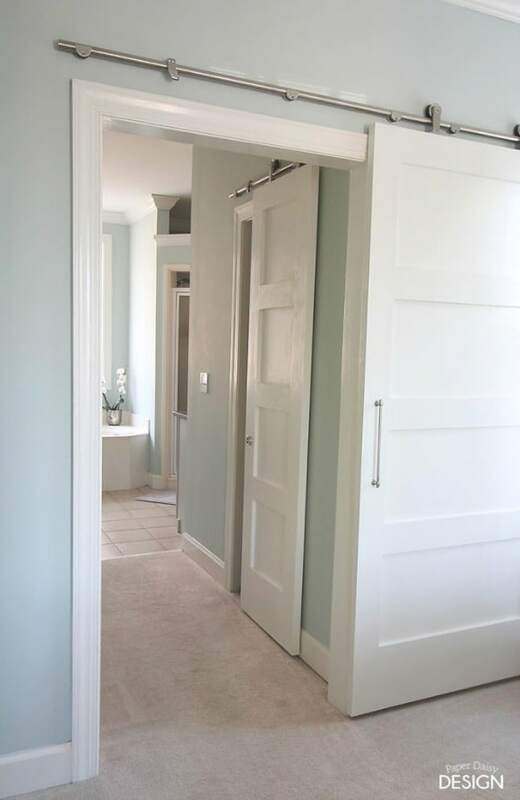 Swinging closet and bathroom doors take up a lot of floor space. Try a sliding door instead. 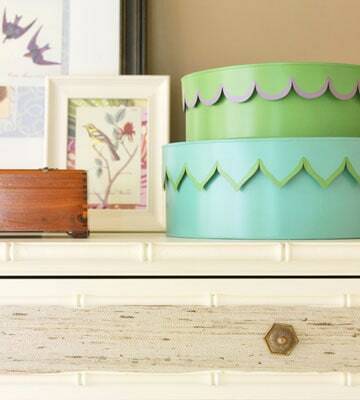 Pretty boxes, stacked together, are a great way to store smaller items in a stylish way. Don’t let a knee wall be get you down. Add a bench for display space. 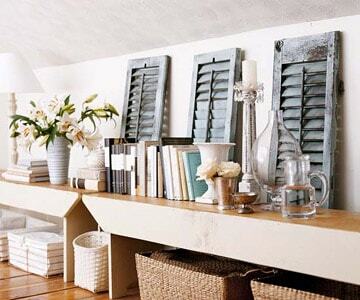 The empty space below becomes a great place for pretty storage baskets. Beds with drawers below have come a long way in the last few years. There are many, many styles and price ranges to choose from. Turn your closet into a feature. 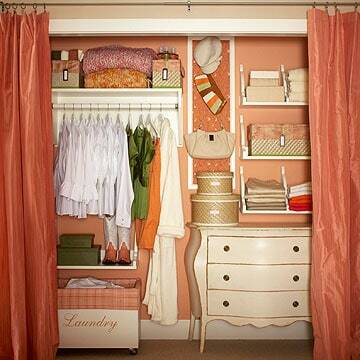 Opening your closet up can give the illusion of a larger room. Plenty of light is key to giving the feel of more space in a small room. Dark corners will make a room feel even smaller. 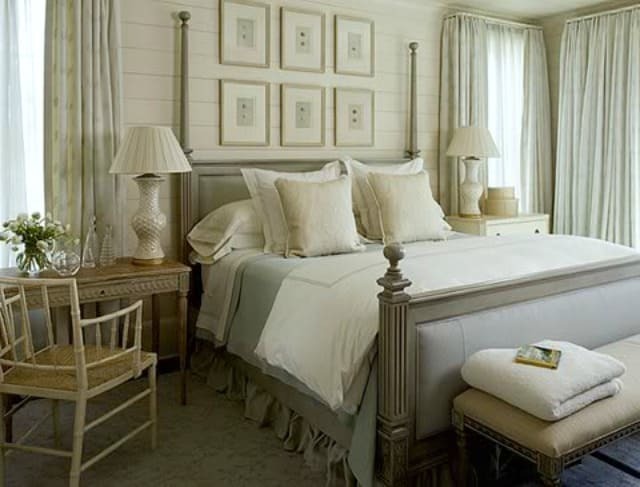 Wall mounted light fixtures are a great alternative if there isn’t room to place a lamp on a table beside the bed. An attractive hanging light fixture or the sparkle of a chandelier can bring a small space to life. Just be careful of the size and the fussiness of the fixture. A too large or too fussy light fixture can visually fill up a room. A rug with just the right pattern can do wonders for a room. Look for a large pattern that isn’t too busy. A striped rug can make a room feel wider or longer. In a small space, you have to be especially careful with accessories. Too many will create the appearance of a lot of clutter. Too few will create a not so stylish sparse or unfinished look. Besides the obvious utilitarian use of a mirror, they also bring additional light into the room. More light equals a more spacious feel. 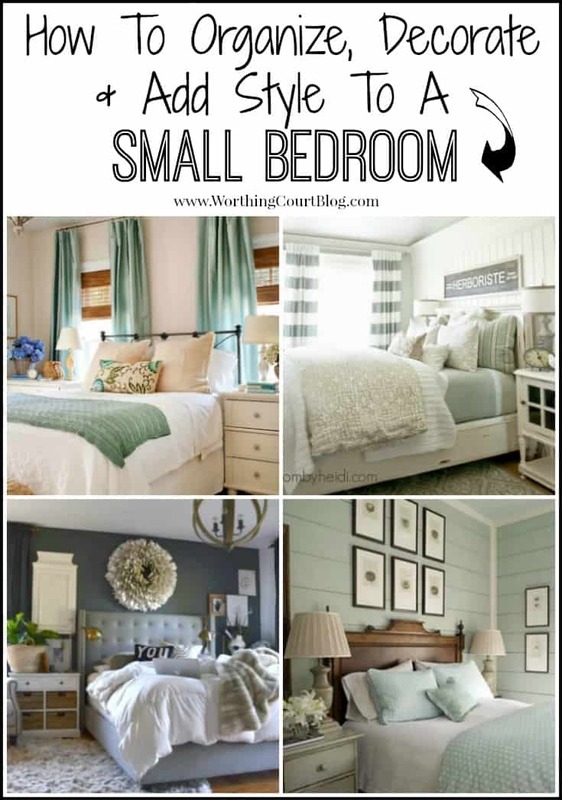 Hopefully, you were able to get some tips for your own small bedroom. Do you have a small space that you struggle with? Hi Marie. I so wish that I could help you, but the bedroom in the picture isn’t mine. I’m sorry that I couldn’t help! 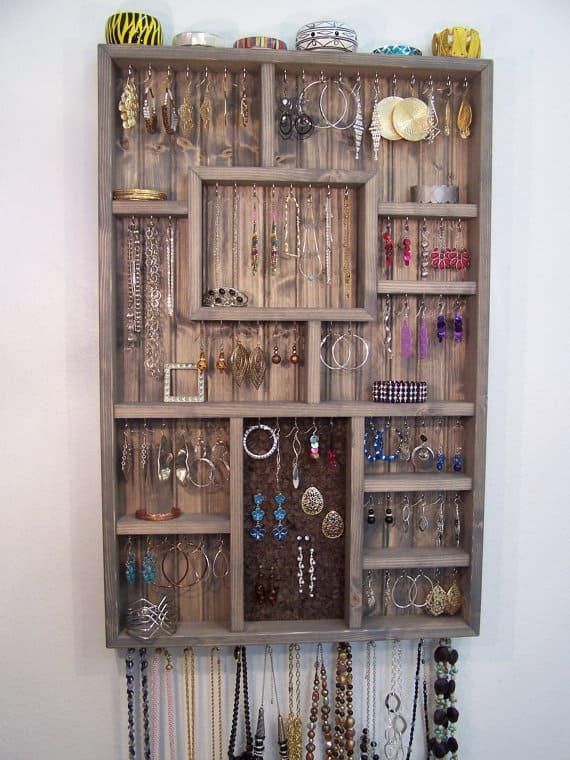 That’s one of the best jewelry storage ideas I’ve seen – most have too few spaces for necklaces. I’m off to DIY it! Some great ideas! 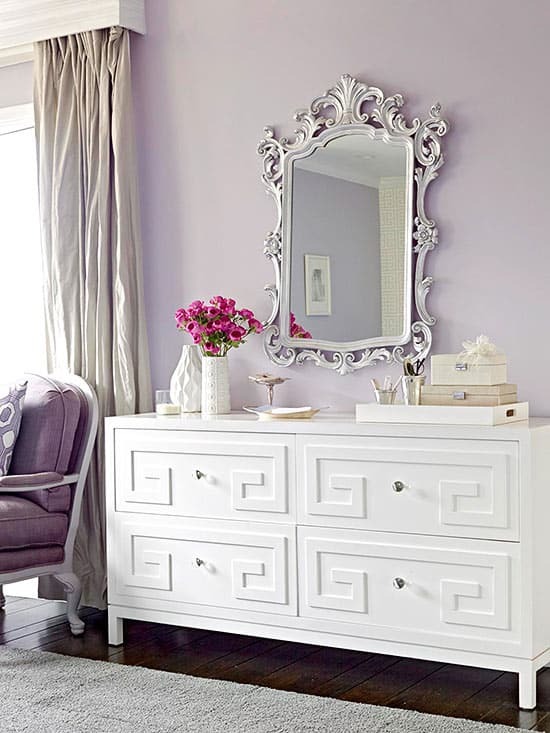 I have a small bedroom that needs some of this inspiration! could you help me to locate the rug in the grey and white bedroom picture Dear Lillie- it said to click on “here ” to order but the rug it directs you too is grey with white designs. I would like the exact rug white with grey pattern. Hi Kim. I found three different options for you. This one from Target is a bit more shaggy: http://www.target.com/p/nuloom-luna-trellis-shag-rug/-/A-50533184 . This pattern is slightly different, but very similar: https://www.amazon.com/Collection-Trellis-Lattice-Contemporary-Options/dp/B019ZSN202/ref=sr_1_2?ie=UTF8&qid=1473947717&sr=8-2-spons&keywords=white%2Btrellis%2Barea%2Brug&th=1 . And this one: https://www.amazon.com/nuLOOM-75-Percent-25-Percent-Viscose-Trellis/dp/B0091B5EBE/ref=sr_1_96?ie=UTF8&qid=1473947932&sr=8-96&keywords=white%2Btrellis%2Barea%2Brug&th=1 . Hope this helps! Love the sliding doors. I am planning on using them all baths and our master bedroom closet. Thanks for your inspiring blog. Thank you for all the wonderful ideas!! What great bedrooms to explore! Hard to pick a favorite…so I won’t. They all have something to copy. Your blog is always so entertaining! I love that you put so many places to choose from. Wow! Those are such awesome tips. Thank you for providing the sources of items in the photographs. I love the small desk in the corner ! GREAT idea for a small room. Love the barn door bookcase in office. Going to use idea in kitchen nook to utilize space and interest. Love your ideas. It always gives me inspiration. 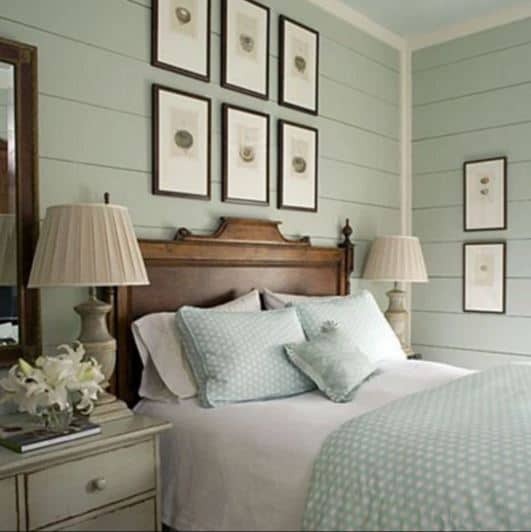 I love that second picture down of the navy blue and cream bedroom with a wooden floor. I really want to use a darker wall colour in our bedroom, but I’m scared it’ll make it look small, although we do have a large window that lets lots of light in. The cream curtains really help to lift the whole thing though, and add some brightness. They’re all lovely bedrooms, thanks for the inspiration! I like your ideas, especially the Shanty 2 Chic. 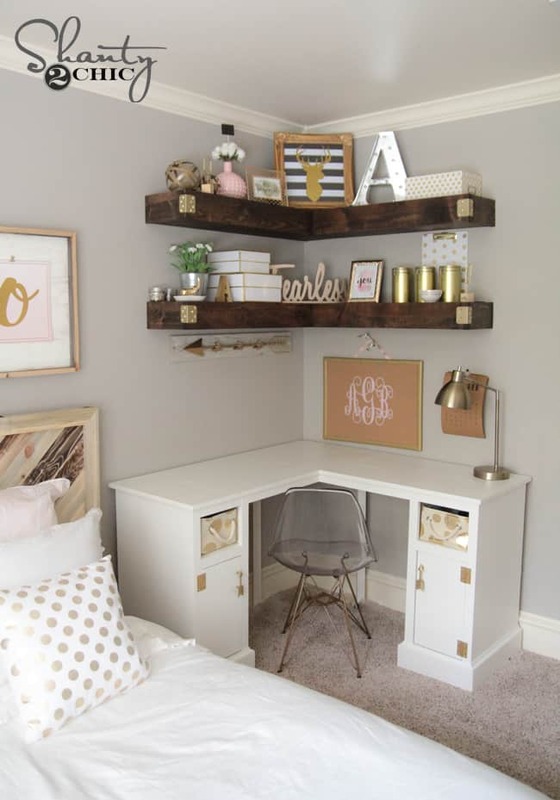 This one is a nice desk for the small room.